For the duration of my childhood, I was raised with the belief that my birth was “the skeleton in the closet” and that I was to never ask about it. I was simply told two different stories during my childhood. The stories were never discussed, just stated. The first story was told to me when I was a child of about four or five years old. I remember it clearly. My mother came up to me, knelt down on the floor and said, “You are adopted. Your mother had too many children so she gave you to us”. Then, my mother kissed me, got up, and left the room. My little world was shattered. My mother wasn’t my mother. She just told me I had another mother. Even a five year old knows that mothers love their children, so why would my mother just give me away? The second story, told to me by my adoptive mother when I was about ten years old, went something like this, “Your mother died of cancer just three months after giving birth to you. Your father thought it best that you live with us”. What is a child supposed to do with that information? I felt a huge hole in my heart, but did not know it was grief. I stuffed my feelings down inside me, just as I stuffed inside the information stated to me when I was five. What does a child do with the statement “your mother had too many children so she gave you to us”? I was too numb to realize that “too many children” meant that I had sisters and brothers. I was raised an only child, so I longed for siblings to play with, but I dared not think about it too much for if I did, then I might actually acknowledge that I had siblings out there somewhere. She knew, but she did not want to tell me. I sat there at a party for my parents’ God Daughter and stared at my mother. It was clear I was to never talk about the subject again. For those of you who think that this is the way it was done in the 1950s and 1960s, think again. To dismiss the importance of the cruelty done to me by washing it away with a blanket statement to excuse the problem because of the social time it happened is to tell me that the issues don’t need to be brought up now: “For God’s sake, it is over and done with.” “Don’t live in the past.” “Get over it.” “It’s the way it was done, so let it be.” “Things are different now.” Are they? Are adoptive parents more careful with their adoptees’ feelings and facts of life? I doubt it. What was said to me as a child stayed with me, creating lasting impressions. These statements haunt me now in the form of traumatic flashbacks. These, and other comments and exchanges, created the PTSD that I must live with now. Oh yes, here’s one other snappy comment made by my adoptive mother to me when I was a child. My mother was angry with me because a neighbor’s child, my playmate of about eight years old, told her mother that I said I was adopted. The mother then reported the news to my mother, who retaliated to me with fierce anger. I was filled with shame for telling another child that I was adopted. I was ashamed of myself, but did not know why I deserved to feel this way. So, today, as the pro-adoption crowd proudly goes on with their happy “National Adoption Awareness Month” of November, I would like to begin by warning adoptive parents everywhere not to make the same mistakes that my adoptive parents made. There will be more mistakes discussed here in the days ahead. I write today’s blog post from the point of view of being the daughter of two mothers: one who gave me life and the other who raised me. It is not easy being the daughter of two mothers, especially since my time with my first mother was so short. She died when I was three months old. She was dying during her pregnancy with me — a death that resulted in my father’s grief and belief that his only option and the best choice of action he could do for me was to relinquish me to the total care of another set of parents. I do not believe that was the best choice. I needed to be with the family I was born into. But since I was raised instead by a stranger who became my mother through a legal decree, I struggle through the sadness and loss each and every day of my life. I grieve for the family I lost because of adoption. I grieve for the loss of a mother who left the earth far too early. I grieve for the mother who adopted me as she was misguided in her possessiveness. She clings to me now in a nursing home. I give her what I can, but mostly, what’s done is done. I’m sad for her suffering and pending death. I also have a step mother who is married to my natural father. Mother’s Day is a day of sadness for me. I start each Sunday, including Mother’s Day, by attending a service at my local UU Church. It’s bad enough that a dear friend of mine, a mother of adoption loss, will not attend our local UU Church (she used to) for the hypocrisy there. I agree with her. There’s wealthy adoptive parents who give lip-service about the natural parents of the adopted children they hold dear. Like the adoptive mother who got a standing ovation for adopting a three year old Haitian earthquake survivor. And don’t get me started about the abundance of gays and lesbians at church who use ANONYMOUS sperm and eggs and surrogate mothers and don’t seem to care that they willingly withhold knowledge of the absent genetic parent(s) to the children so created. In the face of all of that, I still attend the Buffalo Unitarian Universalist Church. My friend doesn’t. I miss her. I honor her for her integrity to stay away. I look beyond these human failings, even our minister who spoke awhile back about the appropriations of other religions, or rather, the miss-appropriations, without even noticing, or caring, that many people appropriate other people’s children with a sense of entitlement. It is not easy to look beyond these in-your-face adoption assaults. I am at this church weekly for the spiritual, intellectual, and suburb musical performances of our choir and musicians. On Mother’s Day, we honor mothers and caregivers everywhere – women who have given birth, women who have adopted children, women who care for the children of others. We affirm the nurturing love of mothers, and the blessings of parenthood. We pray for a society in which pregnancy is freely chosen, and mothers and children receive the care and support they need. We affirm the sanctity of life and the moral agency of women. We mourn the 1,500 women around the world who will die today in childbirth, or from the complications of pregnancy, because they lack basic health services. We envision a world where childbirth is safe, and all children are wanted and loved. Together, we break the silence surrounding women and their partners who suffer infertility, pregnancy loss, still births, and difficulties in adoption. We bless them and hold them in love. We celebrate the many ways that people create families and become mothers in our communities. We call for a commitment to make every day Mother’s Day. * Every minute, a woman dies in childbirth or from pregnancy-related complications – at least half a million women worldwide every year. * 99 percent of all maternal deaths occur in developing nations. More than half occur in sub-Saharan Africa, and one-third in South Asia. * Most maternal deaths take place during labor, delivery or in the immediate post-partum period. More than 3.4 million newborns die within the first week of life. * More than one million children are left motherless every year due to maternal deaths. Children are three to 10 times more likely to die within two years of the mother’s death. * The leading cause of death for girls ages 15-19 worldwide is pregnancy. * There is no single cause of death and disability for men that compares with the magnitude of maternal death and disability. * Doubling current global investments in family planning and pregnancy-related health care (to approximately $24.6 billion) could save the lives of 400,000 women and 1.6 million infants every year. The Rachel Sabbath Initiative: Saving Women’s Lives supports the United Nations’ Millennium Development Goal 5, which focuses on improving maternal health. The Religious Institute calls on congregations across the country to raise awareness and support for the UN’s targets of reducing maternal mortality worldwide and achieving universal access to reproductive health care by 2015. This initiative is named for the matriarch Rachel, who died in childbirth (Gen. 35:16-20). In an effort to spread the word that maternal health is important, the UU Church sorely misses the mark on the focus of adoption. We don’t have specific statistics, but for every adoptee there is a mother who gave birth. That mother suffers the loss of her child to adoption but society does not recognize nor acknowledge that loss. There are millions of childless mothers (because there are at least 6 to 7 million adoptees in America) who grieve for the loss of their babies and who dread Mother’s Day because they were made feel shame and guilt for even being a mother in the first place. We must practice Adoption Prevention. On Mother’s Day, we honor mothers and caregivers everywhere – women who have given birth, women who have adopted children, women who care for the children of others. We also honor mothers who have lost their infants to unwanted relinquishment to the adoption industry by resolving to end this practice of taking other mothers’ children as our own. We mourn the 1,500 women around the world who will die today in childbirth, or from the complications of pregnancy, because they lack basic health services. We mourn the countless women around the world who suffer the moral indignation of disrespecting the pregnancies and infant births by the unwanted snatching of their infants at the moment of birth at Crisis Pregnancy Centers and Birthing Rooms that allow adopting couples to witness the sacred moment of birth, and mothers who are victims of Open Adoption scams and Open Adoption Agencies. We mourn the scorn still inflicted upon young teens and young women who are not married and humiliated into giving up their wanted babies because society tells them they cannot parent their own children. Together, we break the silence surrounding women and their partners who suffer infertility, pregnancy loss, still births, and difficulties in adoption. Difficulties in adopting other women’s children? We break the silence that women who desperately want their children are taken advantage of by the cruelty of the adoption industry — women who want their children ought to not suffer their children ripped from their arms into the waiting arms of adopting parents. If and only IF a child does not have caring parents is GUARDIANSHIP NOT ADOPTION ever a substitute for motherhood. In cases of abuse and neglect, removing a child from harm is best, but working toward reunification and stabilization of that family unit is primary to the wholeness of that mother and her children. We celebrate the many ways that people create families and become mothers in our communities. We celebrate to every mother the right to be mothers in life, and to be named on their child’s birth certificate, not dishonored by sealing and falsifying that document. This means that we honor the facts of birth by issuing ONLY 1 true Certificate of Live Birth and strive for the abolition of the amended birth certificate in adoption; such a document is a mockery of motherhood. Ultimately we strive for the abolition of adoption itself for every mother who gives birth and who wants her child needs to be a mother and every child needs their mother. For adoptive mothers everywhere, we strive for the acceptance that the role of raising children can be handled by a caregiver who is a guardian who does not usurp the dignity of another mother by taking her child. I have no choice but to accept that I have two mothers: one by birth and one by adoption. My lesson learned from my life lived in this reality is to strive for a better world in which the sanctity of motherhood is respected everywhere on this planet. What might appear to be harsh to the adoptive mothers out there is actually a plea: stop trying to own someone else’s child and if you must fulfill your desire to be in a parenting role, be a guardian and not an adoptive mother. A guardian respects that child’s identity and true mother. Adoption, by its very nature, disrespects both the child and her natural mother by destroying the natural mother-child bond. Caring and love in a parenting role can be achieved by guardianship. Offended? 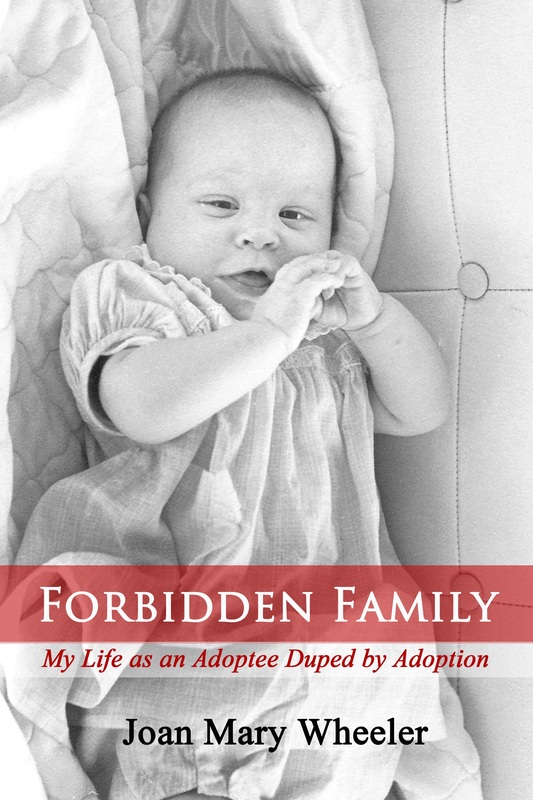 I am offended that my life as the daughter of my mother who died in my infancy was not honored nor respected because of the all-almighty power of adoption. PS — See this post: Happy Birthmother Day or Happy Adopter Day; and this quote from AustinHolistic : Which makes me think, if a woman wants her child, we need to provide emotional support, financial support, and psychological support for women who want their children: and this post with this quote: There is no paradox, no contradiction and certainly no upside in having been on the loosing end of the adoption exchange.